Well, plywood, really. 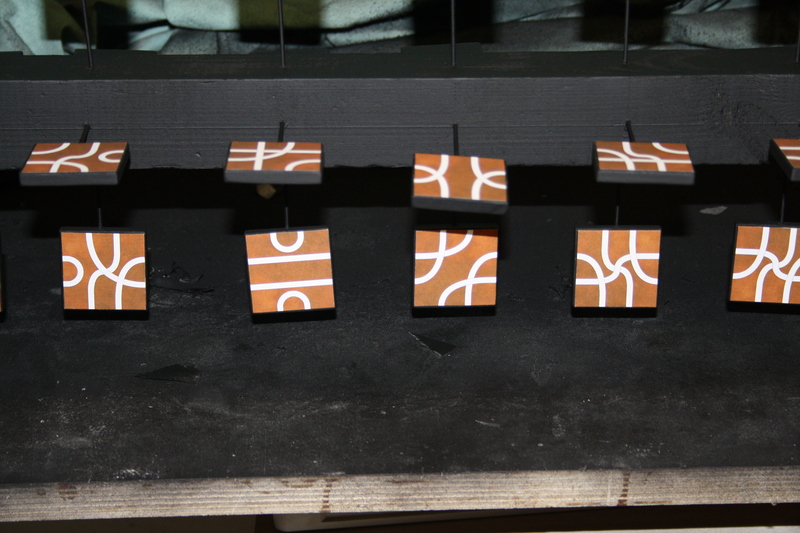 With printed paper glued on top to make the paths. 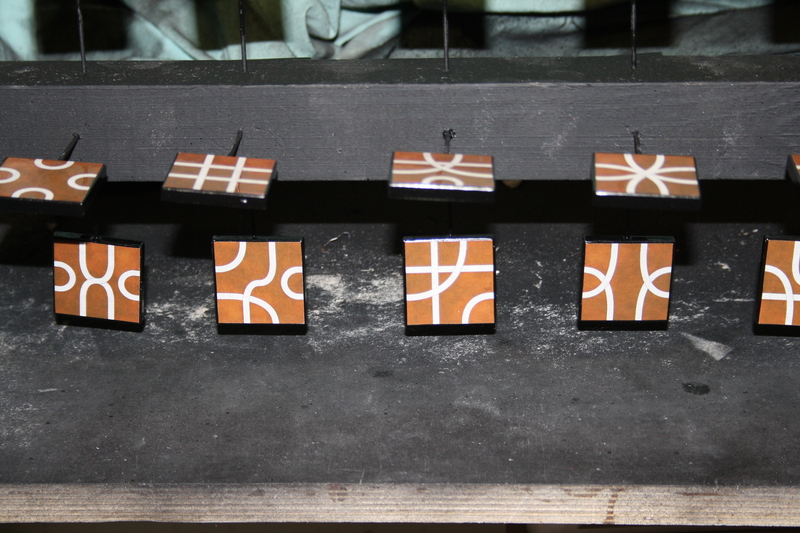 What I actually want is a set of tiles where the paths and the background are made of different coloured wood veneer, but that would require investing in some new tools and spending a lot of time cutting the pieces. So, for now, I’ll settle for the plywood tiles so I can start playing. 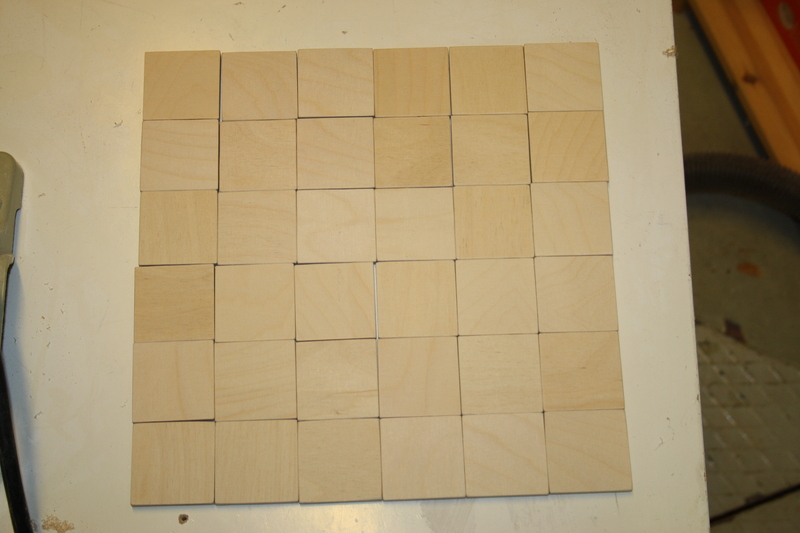 I started with a piece of cheap hardware store-grade 6,5mm plywood, which I cut into 44mm squares. Then, I selected 36 of the nicest pieces, with the least voids and knots. 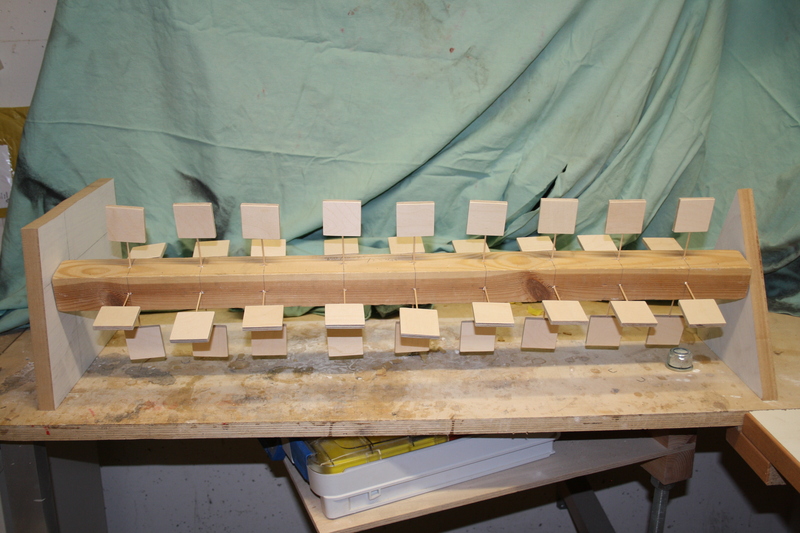 All the pieces clamped together for drilling, with the holes drilled and the cocktail sticks glued on. 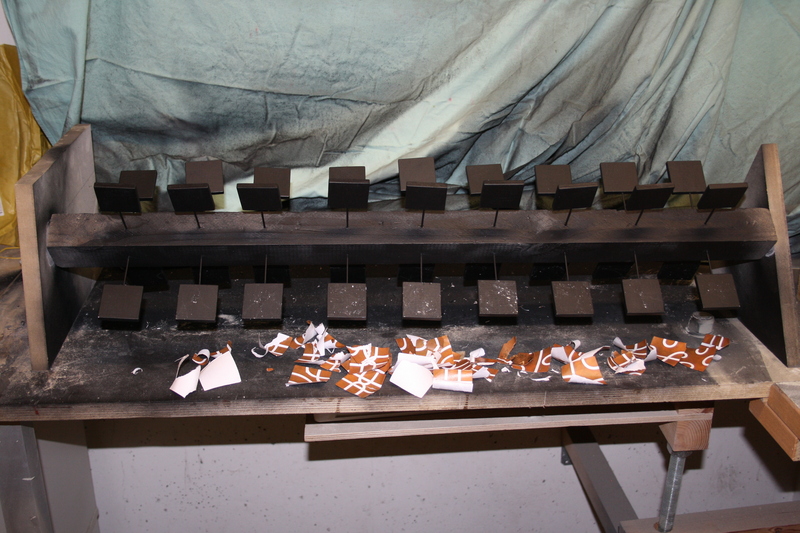 If I do something like this again, I’ll do the spray painting first with the pieces lying on a flat surface. 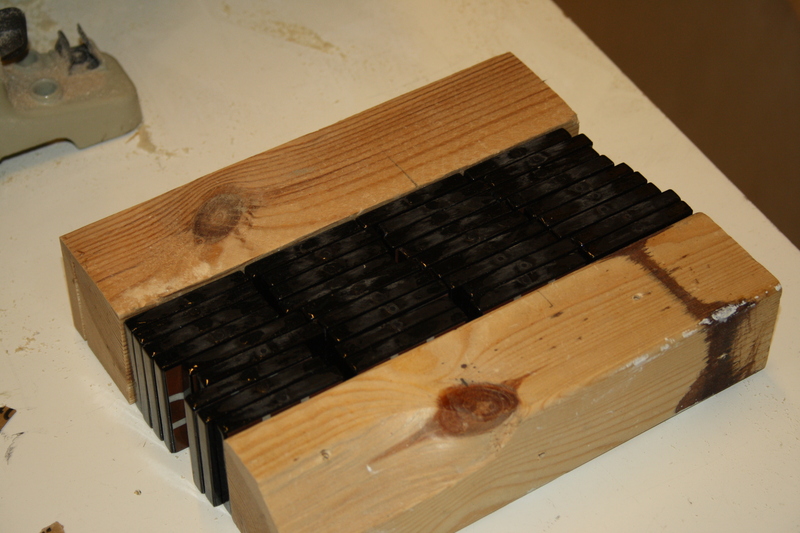 Tiles glued on to the contraption using cocktail sticks. 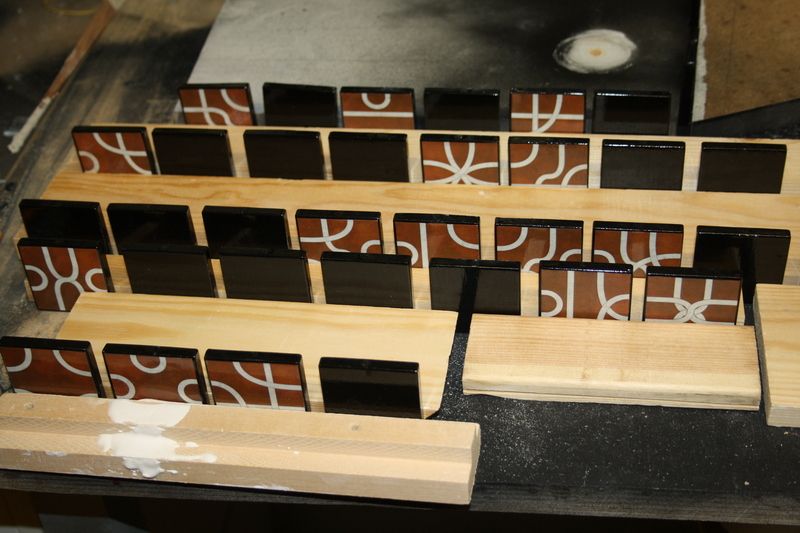 The bright idea *) I had here is that I’ll be able to brush varnish on (almost) all of the surface of each tile. This way I don’t need to worry about how to hold the tile while brushing the varnish on, and once I’m done I’d just remove the cocktail stick and patch that part. 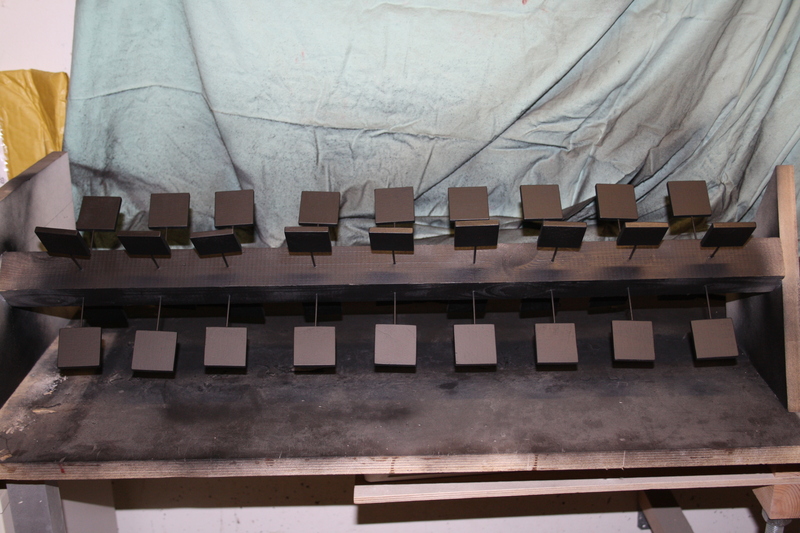 After first coat of matt black spray paint. I chose matt instead of glossy in the hopes that the varnish would stick to matt better. Like I mentioned above, this would’ve been better done with the tiles laying flat, as it was kind of difficult to make sure all the faces of the tiles got painted, without ending up with too much paint on some faces. 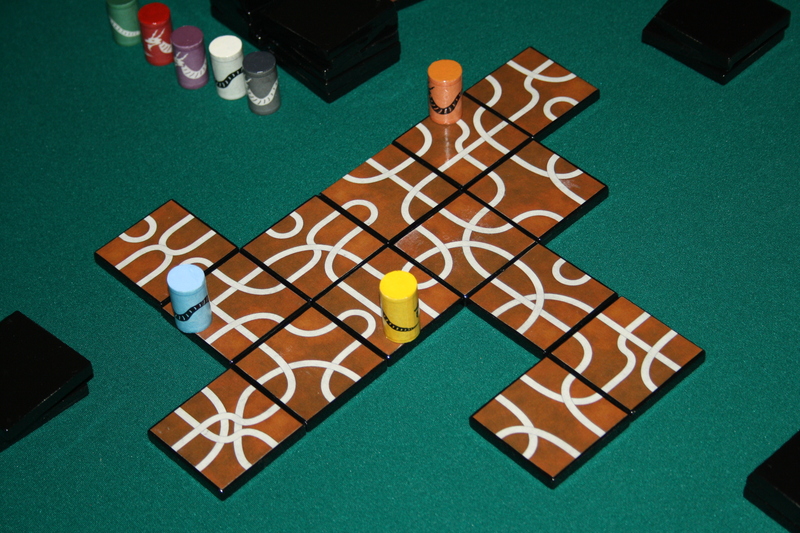 Prints of ZeroCool_ITA’s homemade Tsuro tiles revised by David Crow glued on. 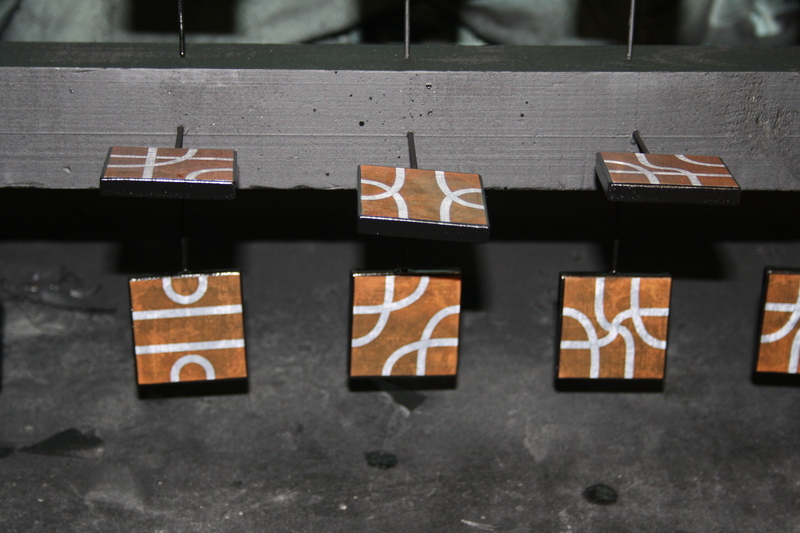 These ones were, like the plywood pieces, 44mm square. 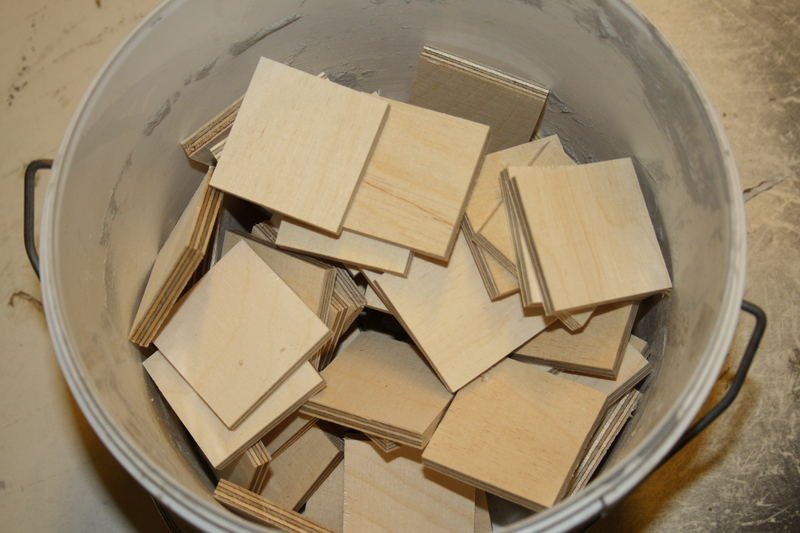 I noticed immediately that the paper pieces didn’t fit too neatly on the plywood because of the rounding of the edges. Anyone with half a brain would’ve admitted defeat at this point, and gone back to get smaller prints. Since my brain is clearly made of smaller fractions, I proceeded to glue all of the papers on the tiles, thinking that “I’ll figure it out later”. “Figuring it out” consisted of shaving off pieces of the papers that were sticking out off the edge of the plywood, and then using a fine point black permanent marker to hide all the white edges of paper that were showing. Yeah. Didn’t really work. New set of prints, this time 42mm square. Much better. The 1mm black margin looks rather nice. 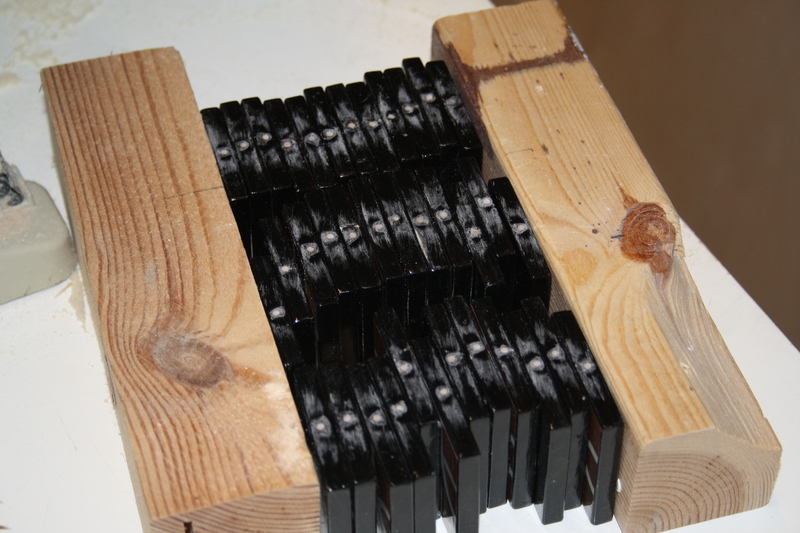 After sanding with 0000 grade steel wool and applying another coat of varnish. In a few places I sanded too hard and took the paint off. After third coat of varnish that would have been the final coat if I didn’t have too deal with the cocktail sticks. *)Not actually a bright idea. Crap. 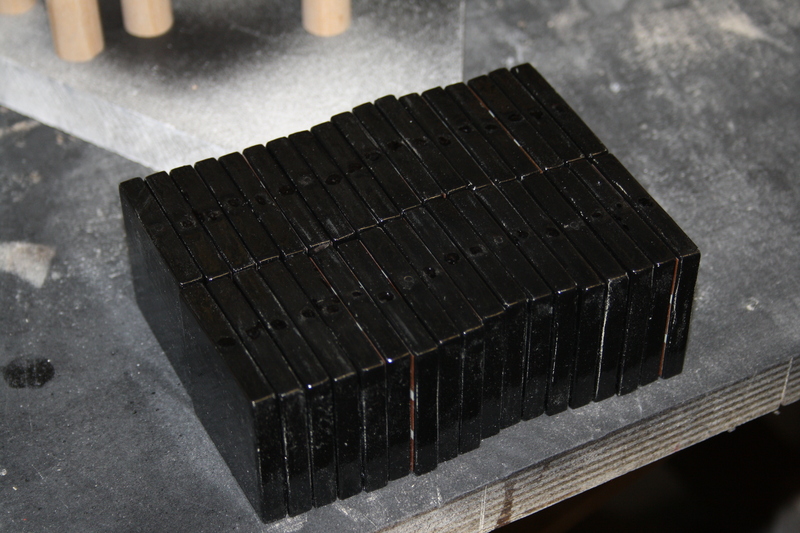 A bit of black acrylic paint and more varnish. 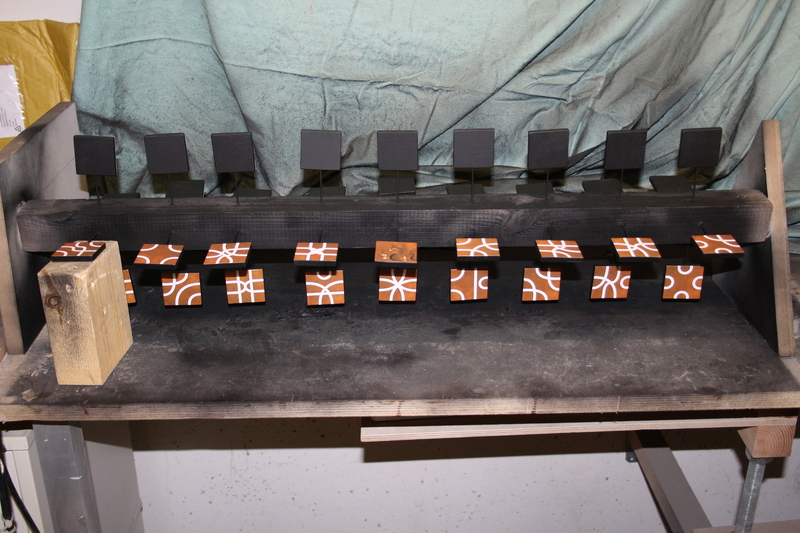 And more varnish. 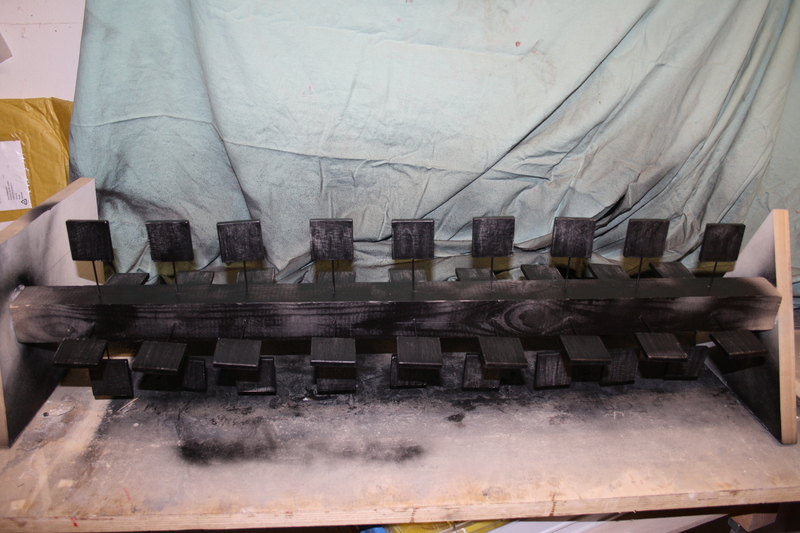 And sanding. And varnish. It took way too much trouble to even get it to look like this. I’m just going to call it “done”. The flash of the camera actually makes the tiles look much worse that they really are. 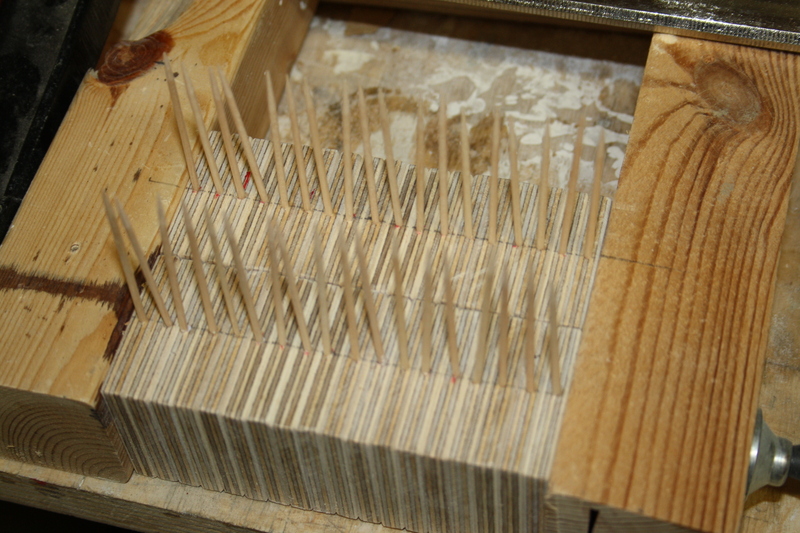 For the markers I cut some 15mm diameter wooden dowel into 25mm pieces. 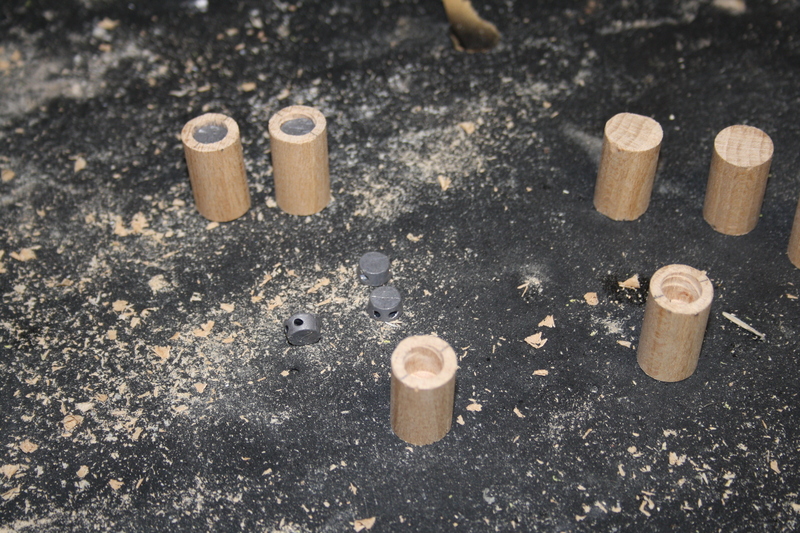 On the bottom of each piece I drilled a hole into which I inserted two lead seals, to improve the balance of the marker. I then decorated them with custom designed dragon pictures printed on paper, and finished with a couple of coats of varnish. I have to be reasonably happy with the end result. 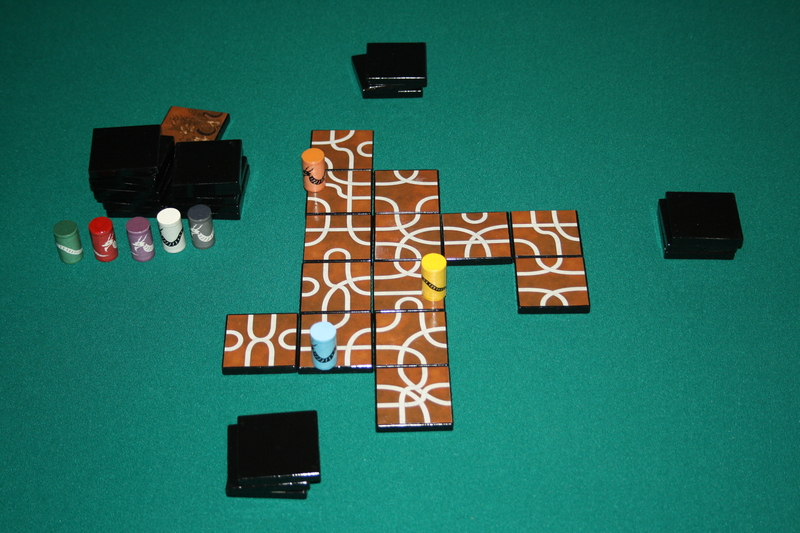 Even though quite a few things failed to go exactly as I planned, I ended up with a playable Tsuro set. I also learned a few things during the process, and I’ve got the next versions of my home-made Tsuro set already planned. Pretty impressive craftsmanship you’ve got there, i am definitely following your future posts! Hi, there – did you also make the board? and if so, would you mind showing it? No, I’ve been trying to come up with a way to make a portable board that wouldn’t take up as much space as a solid one, but haven’t really had any ideas that I’ve liked so far. I’ve just been using a simple board printed on paper.